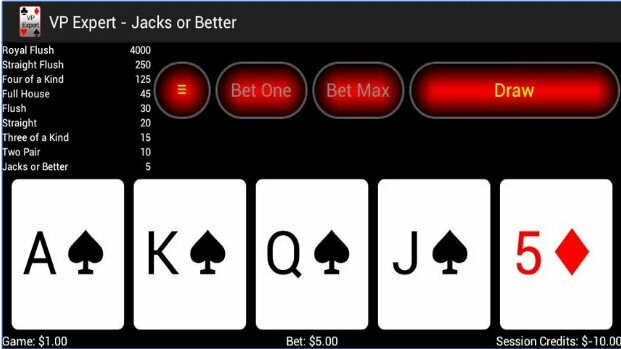 Video Poker Expert: The best video poker strategy app for Android? Winning big at the casino is something we all dream of, but smart players know very well that the odds are never really in their favor. To increase the odds, many experienced gamblers use intricate strategies that decrease the house edge to an absolute minimum. Most people believe that blackjack is only game that provides such a strategic advantage. Yes, by using perfect strategy, you can decrease the “house edge” to almost zero. For expert card counters, achieving a “player edge” is actually possible. But as they say, there’s more than one way to skin a cat, and you don’t have to be a quick-thinking, mathematical savant to do it. A lot of people don’t realize that video poker—a single player, machine based game (i.e. no outside interference or time constraints)—can also provide players with a near-zero house edge. The trick is to learn proper video poker strategy. That’s why I’m writing today to tell you about a free Android video poker app called Video Poker Expert. Video Poker Expert is an older application, last updated in April 2013. That may sound like a bad thing, but in reality, it means every Android device still in existence, operating on Android 1.6 and up, is capable of running it. And besides – why fix what isn’t broke? This video poker strategy app has its ups and downs, though. The graphics are very basic, as you might imagine with an antiquated build. The screen isn’t designed to rotate, and every once in awhile, it crashes for no apparent reason. Some have also complained the display is a bit too large to fit to their screen. You’ll notice I started with the bad stuff, but there’s a good reason for it. I want to get it all of that out in the open, and out of the way. I know, you’re thinking I’m crazy. You’re filled with doubt at this point. That’s okay. Now let’s take a look at what this video poker strategy app can do. Video Poker Expert for Android teaches players how to use perfect strategy in any situation. It offers training as well as hand correction if the wrong choice is made, incorporating perfect-play diagnostics based on genuine odds and probabilities. 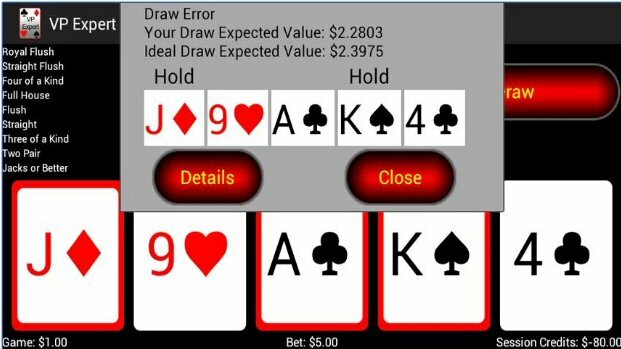 This Android video poker app doesn’t just notify players if they’ve made a wrong choice, it explains why, and the what the proper choice would have been. Video Poker Expert tells players the odds-based expected value (EV) of the cards they choose to hold, the EV of the best hold option, and the difference between the two. Although the rules of each game listed above don’t waver, the pay tables certainly do. One land-based casino may offers a different pay table, on the exact same game, than another casino. The same goes for online casinos, where the software’s creator is responsible for setting pays. If you know which game you’re going to play for real money, you can adjust this app to teach you proper video poker strategy for that precise game and pay table.